I thought I’d try the photo a day thing again, as it makes me remember to post. This is Tiptoe, who is Russian blue and is two years and five months old. She had her fortnightly tooth trim today, so she’s celebrating being able to eat properly. I’ve been a little busy with some new babies for the past couple of weeks. Here’s the latest video. It feels like spring today. The weather is warm and humid, with a slight warm breeze. I even passed some may blossom on my walk to work. The cherry trees are showing buds, but the pink or green buds (whichever they are) don’t stand out to my colour-blind eyes. The white may flowers stand out, even though only one of the bushes in the hawthorn hedge had bloomed. I think this year’s obsession is going to be the rat agility. Last year it was books, but the urge to make more has faded even though I still have more ideas. Now I’m lying awake at night plotting new obstacles to make, rather than plotting new books. I have a co-conspirator in the rat club, someone who is handy at woodwork so can make agility obstacles for any of our members who want to try it. It’s all a learning process right now, we don’t even have an agreed set of rules yet. What I don’t want is to be the person judging the competition at the shows. I don’t mind leading the training discussion on the club forum, or showing people what I’m learning, but I want to be separate from the judging so I can compete on a level standing. Well, I and the rats are gradually learning how to train for the agility competition. I began by trying to clicker train them, using a tongue click, but that works best one on one because they all expect a treat at each click, and I just can’t do that with 34 rats. I’ve switched to just giving a treat when they get it right. They seem to enjoy it so much it seems a shame to leave anyone out, and it is really good for my relationship with them because it keeps me focused on them while they are out for playtime. So the current method is crowd training with cage each group of 7 or 8 rats. Absolute chaos, but we’re having fun. The main thing they are learning is that mum wants them to do something, and if they can work out what it is they get treats. I don’t think we’re ever going to be world champions like this, but hey. This video is from a few days ago before I abandoned the click. My local rat club, the Midlands Rat Club, has had a rat agility course since I first started going to shows in 2001. It’s always been a fun event at the shows, with no-one really training their rats but the rats being willing enough and bright enough to be persuaded around the course on the day. 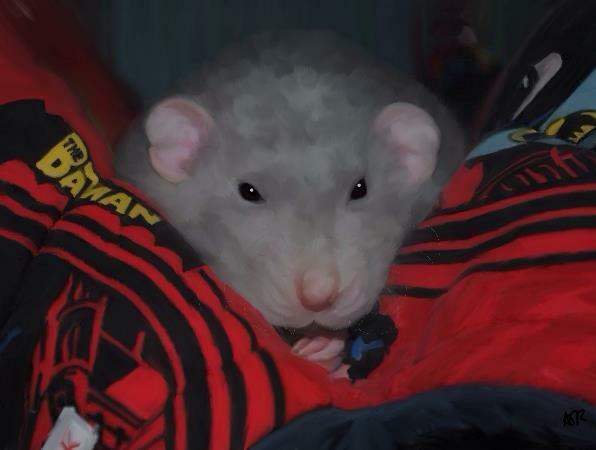 The committee, of which I’m part, have now decided that it would be good to promote the agility event as something that can be trained for in advance, with the thought that it would improve the bond between rat and human and provide an opportunity for enrichment for the rat. Having shown some enthusiasm for the idea I’m now trying to lead the way in learning to train our rats, even though I have no experience at all of training animals. 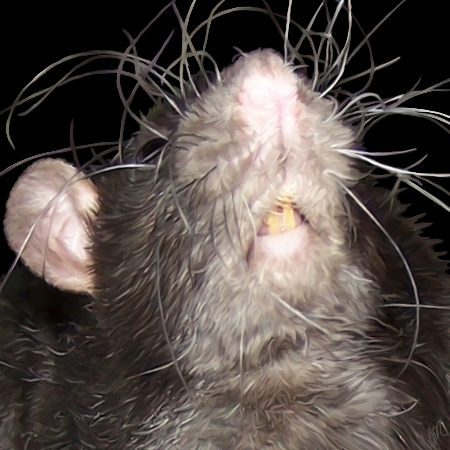 We’re running an online workshop on the club forum, with quite a few people interested in learning to train their rats and make their own practice equipment. I’ve watched some of the many videos on the topic on Youtube and read a good few pages on training both dogs and small pets, and I’ve decided to try clicker training my rats. I have something of an advantage as I currently have 34 rats, so I can select the ones that appear most interested. It’s two days since I began trying to train the rats. Some of the advice is to get them used to associating a click with a treat by clicking and then treating. That was mayhem because as soon as they realised I had treats they all started mobbing me for them. There just isn’t time to try out 34 rats separately in an evening, so I decided to try teaching them their first obstacle at the same time. The hoop seemed most sensible, as that is usually the final obstacle. On Tuesday night little Crystal Tips, who is seven weeks old, very quickly got the idea that click was followed by treat, but didn’t quite get the idea that she needed to jump through the hoop to get the click. Arwen, a seven month old in a different cage group, soon learnt that she needed to jump through the hoop to get the food but didn’t quite get the point of the click. As of last night, both Crystal Tips and Arwen have now totally got the hang of getting a click as they jump through the hoop and then waiting for a treat. 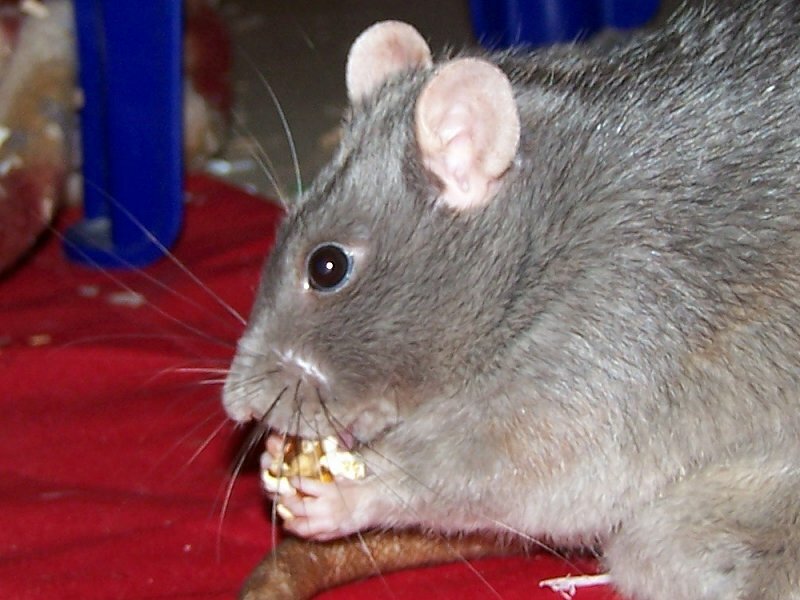 The puffed grains from Rat Rations make a nice reward because there’s very little substance to them but the rats like them. Asha is also learning the jump quickly too, but she was mated up six days ago so I won’t want her jumping around too much soon. She’ll have to wait before we take her too far. I’m trying to use clicker training, but I’ve never trained an animal before so I need to learn the ropes too. The idea is that the rat gets a click at exactly the moment they do what you want them to, so they know what you are trying to teach them and they know they are about to get a reward. I’m clicking my tongue for now, but I might get a clicker later. It will be interesting to see how different people’s ways of training compare. I suspect the rats will learn however we do it. It’s quite confusing at the moment because I’m trying to do it while the whole cage group is out, so I’ve got several rats at a time milling about and getting in one another’s way. After Saturday when I introduce the baby boys to their daddy and uncles I will only have five groups to get out every evening rather than six, so I’m planning to use that extra half hour to do one-on-one training with the rats that seem to catch on quickly. Once I can do one-on-one I will add in the balance beam, I think, and try to teach them to go along the beam and then through the hoop. 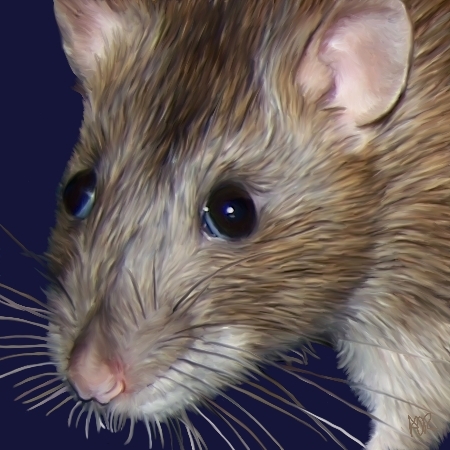 Rex rats are so fantastic to draw, especially Unanimous Boots here, whose whiskers are even wilder than most. I do feel sorry for them sometimes, the way their own whiskers poke them in the eye or tickle their nose. I know their brains can re-map the whisker input to make sense of the chaotic randomness, but it must be more challenging to interpret the signals. It’s so good to have a litter of agouti babies. I love the way their coat is made of so many different colours. The drawing above is of Sparrow, an agouti doe, but adult bucks show the colour off fantastically well too. The little black babies are blacker than black, gorgeously shiny and smooth, so I’m hoping they don’t start to silver too soon. This is a video of the babies yesterday at 15 days old. I’ve got them on my webcam at the moment too. I love the little yips they make. It makes me wonder if the sound were slowed right down whether it would sound like little puppies yapping. 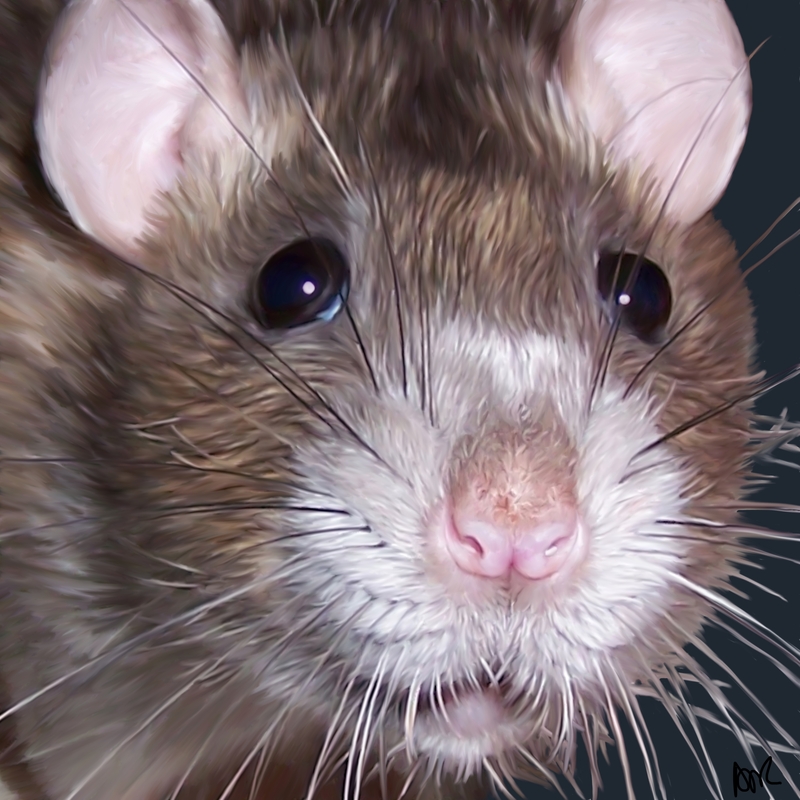 Adeline wishes to make it clear that despite the use of her photograph in the recent article published on the Rugby Advertiser website she has no connection with the sighting of a rat in the University Hospital, Coventry, and that she was in fact at home with her family at the time of the alleged sighting. 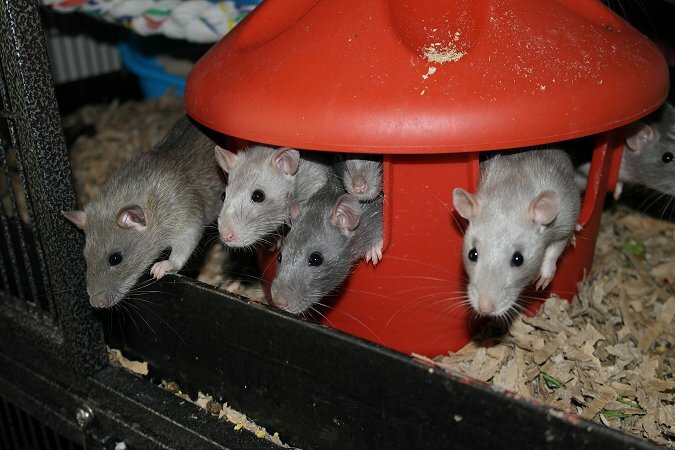 Adeline has leapt to celebrity status following her starring role in the recently published book, ‘The Rat’s Whiskers’, and is pictured here (far left) relaxing at home with her sisters and cousins.